The Junkdrawer of Thought: This... Is... Sparlock!!!!! Hello, I'm Daniel Thompson. Perhaps, you recognise me from such blogs as the riveting Lutes, Viols and Other Ancient Instruments and the ever popular Resources for the Microtonal Composer. Well, this is where I put thoughts that have no where else to go. Welcome to The Junkdrawer of Thought! Sparlock The Warrior Wizard is an unlikely hero. He was invented by a religion who thinks plastic "magical" toys are evil and should be thrown away. To reinforce this view, they produced a video where a young boy is guilted into throwing away a Sparlock action figure. This video went viral on the Internet before it was taken down due to a copyright complaint by the Watchtower Bible and Tract Society of Pennsylvania. This just caused new videos to spring up that included commentary and are at least theoretically protected under fair use. Here is one such video that tells the story of Sparlock and includes scenes from the original video. There has already been a lot of commentary about this video here, here and elsewhere, so I will confine my comments to just a few points. I think the fact that Caleb threw the toy away outside is important. It may seem that they were just setting up the prospect of riding bikes, but I was raised in that religion and have a different perspective. The problem with Sparlock doesn't seem to be that he represented magic. There may have been a real fear that he actually was magical. This seems strange, but there is a profound fear of spiritism among many Jehovah's Witnesses. I wasn't allowed ghost stories as a kid. We didn't believe that ghosts were real (this is due to the Jehovah's Witness belief that the soul dies when the body dies, but might be resurrected in the future), but we did believe that demons sometimes pretended to be ghosts. Demons are very scary and real to a lot of Jehovah's Witness kids and adults. We sometimes told demon stories around the campfire and late at night. They were extra scary because we thought they might actually be true. Many of these stories focused on bringing items into the house from nonbelievers or former believers that were infested with demons. The demons would cause a variety of problems (nightmares and strange sounds were common symptom of demon infestation) and the situation would usually resolve itself when the item was removed from the house and thrown away. An interesting feature of these stories was that it was sometimes difficult to determine which object was causing the problem. The person would often have to think about recent purchases and gifts and try to determine if one of them may have come from someone who was demonized. The Smurfs caused a bit of mass hysteria for a while with a large number of crazy stories spreading which indicated that they were demonized. Part of the criticism of the Sparlock video comes from the way it reinforces these types of phobias. I'm not saying that the makers of the video necessarily believed this would happen if a wizard toy wasn't thrown away outside, but they would have certainly been aware of this superstition among their intended audience. 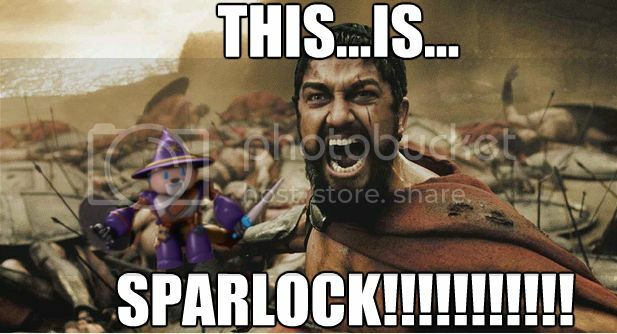 Sparlock The Warrior Wizard is unstoppable. 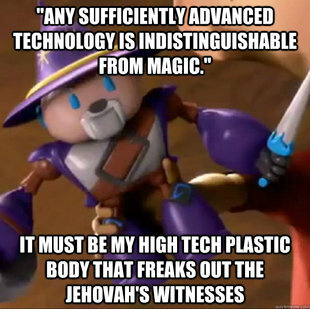 I'm sure that the Watchtower Society will never be allowed to forget the little toy wizard they created. See also the Unofficial Home of Sparlock. Update 6/5/12: I ended up revisiting memories in this blog post that I hadn't thought about much in recent years. I spent some time thinking about whether I had portrayed the situation fairly. If anything, I think I made the mistake of viewing my childhood with rose colored glasses. I should point out that there were regional differences with these demon stories. Witnesses in my area were generally content to just throw away questionable items (outside of course), but some Jehovah's Witnesses considered it important to burn the items. However, I heard a lot of stories where the items wouldn't burn or released the demons to cause more mayhem. There didn't seem to be general agreement on the best way to dispose of these items. As I grew older, I began to view these stories as more and more implausible. There was a fear and fascination with garage sales. Many of the Witnesses I knew loved to get good deals, but had a fear of bringing home something that would contain demons. I had bought a lot of items from garage sales and never had any problem. My mom, however, would often just leave a garage sale if she saw something that made her feel uneasy like a toy wizard or movies or books with magical or spiritistic themes. Sometimes, she just reported getting a strange feeling without seeing any questionable items. So when she would get this feeling she would just turn around and go back to the car without telling me or others where she was going (we often went to garage sales for a break while we were knocking on doors distributing Watchtower and Awake magazines). If she disappeared, it was usually because she got scared of demons. This is one of the reasons I'm so critical of that DVD with Sparlock. It is aimed at children, but reinforces superstitions and uses fear as a way to try to control young minds. Update 5/29/15: I have written a novel that mentions the infamous "Summer of Sparlock." It should be released in July of 2015. You can visit this website for more information. Very similar to my experience growing up JW in New Zealand. My mother also instilled a fear of demonised objects, but it wasn't consistent. Also it wasn't as extreme as portrayed in the Sparlock dvd. Some very cartoonish characters were allowed, eg smurfs. But she would've drawn the line at Garmgamel!